Phew...I haven't spent enough time at my easel this week! I had two more internet sales, and finally got round to insuring and mailing them today. These two are headed for Queensland. Keep a look out over the weekend, a new painting should be posted for viewing and sale both here and on the net's trusted "selling & buying site". 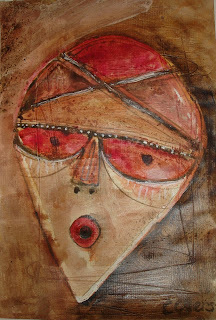 "Mask Of Gratitude" Mixed Medium.